An awesome annual 3-day free festival bringing brass bands from all over the United States and the world to Somerville for a celebration of music, community and activism. Organized entirely by volunteers and now in its 10th year, the festival kicks off on Friday night with a lantern parade in Davis Square neighborhoods and a band showcase at Johnny D’s. On Saturday more than 25 bands take over Davis Square for a giant music and dance party. On Sunday, local community groups, artists, and activists working for a variety of progressive causes — economic justice, protecting the environment, world peace, an end to racism — join the brass bands to make a spectacular parade from Davis Square to Harvard Square along Mass Avenue. Other HONK! Fest activities include a Day of Action, when bands convene to play on behalf of a cause, and roundtable discussions for participating musicians and organizers of other HONK! festivals around the country to gather and share experiences. HONK! in Somerville has inspired festivals near – Providence, Brooklyn, Seattle, Austin, Detroit, and far – Australia and Brazil. Boston Magazine recognized HONK! with a “2015 Best of Boston” award, writing “The music pounds in your chest. 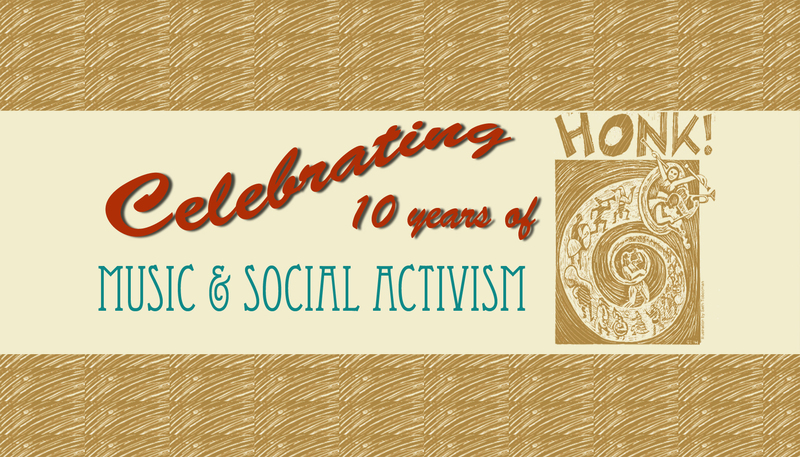 The activism moves your soul.” Please join us for our 10th anniversary celebration, and consider supporting the festival by volunteering, housing visiting musicians, or making a donation!